Preparation is key to a successful day in the heat. This week was my first week back to Save the Harbor in a while since I last worked here in 2015 and what an amazing time I had on the water, at the islands and various cites. I feel like I’ve accomplished so much in just one week and the summer is only just getting started. I know coming in to the summer that I would go to different cites, see different groups of people and encounter all kinds of different situations; but I was prepared for it. I believe time and preparation is the key to success no matter what you do and it’s important to me that i make myself flexible in terms of doing whatever it takes for the team. An amazing first week back, with amazing people and I couldn’t be any more excited to get back on the beaches and continue to impact the lives of others. 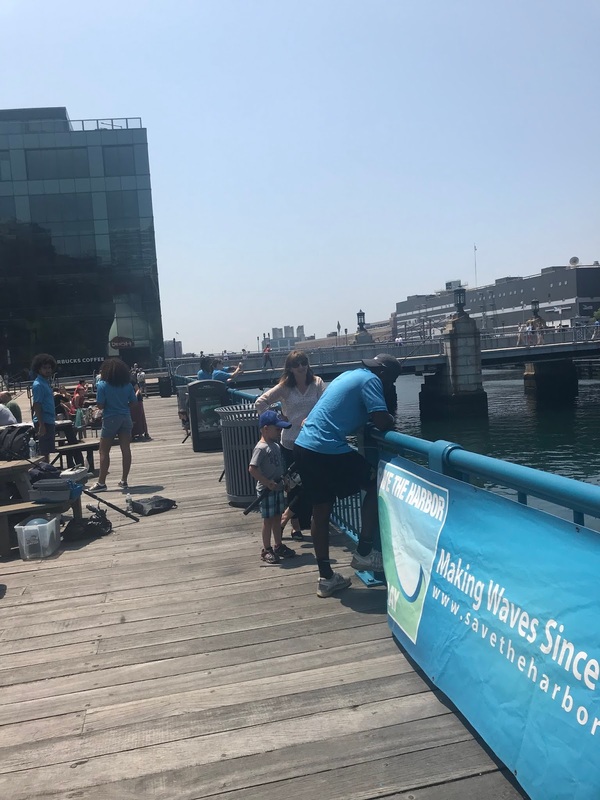 In really nice weather with a beautiful view of the Boston tea party and downtown Boston, Save the Harbor lead a group of really amazing kids who came with not only enthusiasm but excitement for not only fishing but , to see the dozens of crabs and fish we caught in the crab trap. At the children’s museum; many people question what the “people in the blue shirts” are doing, and very little know our cause or our history. It was a blessing to be able to encourage people to eat the fish that come from the Harbor because it’s clean and to be more active in the Harbor. Whether it’s taking a day trip to one of the islands, going swimming, or fishing or even going to the beach. Some kids have never seen a fish caught before although they may have been fishing in the past or fishing for the past 30 minutes with us on the pier. Although we didn’t catch much fish with our rods, the important thing is that hundreds of kids came and learned something. There is no greater joy in the world than seeing the youth who admire and look up to you walk away feeling satisfied because I was about to brighten their day and teach them a thing or two. At the Children Museum I met a young man from Minnesota who came to Boston on vacation and couldn't help but notice the people in the blue shirts doing his favorite activity!!! FISHING. I started off by delightfully inviting him and his mom to come and fish or at least learn to fish, but very little lesson was needed as he had done it before. We connected over other things such as the differences in the water here and the water in Minnesota. 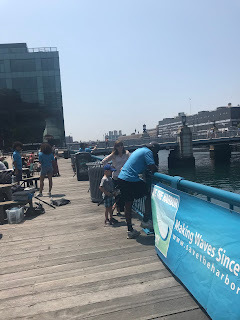 He who quickly disengaged in the topic of history about the Boston Harbor continued to get satisfaction out of reeling in the bait and dropping back into the water. His mom however was very pleased with what she learned regarding the clean up of the Harbor and out contribution to that process. Time has passed and the young man didn't move an inch from his fishing rod or move a muscle. What seemed to be an experience that would go on forever I showed him the crab trap and he fell in love with reeling in crabs. I didn't mind spending the whole day with him but it seemed the two had to get moving to their next adventure in the beautiful city. He didn't want to leave and for a second I thought he would chose fishing and crabbing at the pier one going back home with his mom. Before he and his mom left, his mom kindly offered to buy me ice cream but I had insisted that she didn’t. Instead she pulled out her wallet and said " I would LOVE to. You were amazing." Few moments later she returned with ice cream for the both of us. -"I think I caught something"
"I think you did too!...." 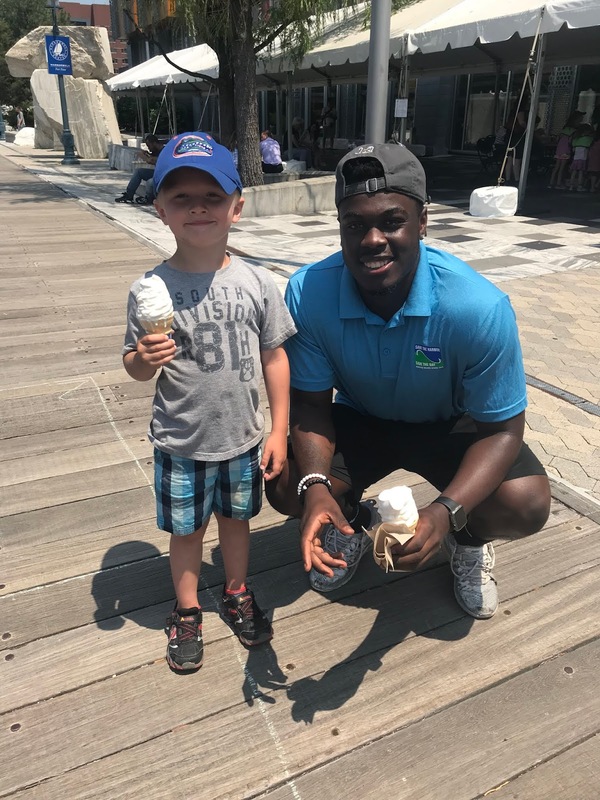 I look forward to seeing more kids and families in the future who interested in learning about the harbor and what we are doing to better the communities. I've met a ton of kids from All Access and Camp Harborview and each experience is different which makes teaching and inspiring so fun; because it is so diverse and every story is different. I am not the best fisherman or the smartest but I understand what I contribute and I am hungry to strengthen my weaknesses. I can't wait to be back on the harbor and blowing in the wind along the beachside.